Feliz inicio de Septiembre mis queridos viajeros. ¿Es increíble cómo ha volado el año verdad? En unas horas estoy partiendo a mi último destino en Madagascar que es el famoso Avenue de los Baobas y después me iré a explorar otro país de África por el cual estoy muy emocionada: Sudáfrica. Pero antes de irme a la zona de no wi-fi me gustaría compartirles un post bastante especial de algunos de mis looks favoritos de Show Me Your Mumu coleccionando veranos y como junto a esta marca podemos colaborar con un grano de arena a todas esas personas afectadas en Houston, Texa por el huracán. Hoy primero de Septiembre Show Me Your Mumu donara el 10% de sus ventas para ayudar a toda la gente que ha sufrido en Houston, Texas. Sin duda es una incitativa donde la moda va de la mano para colaborar a una gran causa. Espero que compartiendo algunos de mis looks favoritos de esta marca se motiven a comprar y así apoyar también a la causa. Me encantaría también saber si ¿Creen que debería hacer mas post de mis #ootds? ya que siento que ha pasado bastante tiempo si hacer varios o ¿prefieren más mis post de viajes? Or maybe ambos?? Todas sus opiniones son bienvenidas. Cuando planie mi viaje al océano indico sabía que dentro de los looks que quería llevar conmigo eran de Show Me Your Mumu, de hecho es una de mis marcas favoritas. Para ser sincera cuando empaco para mis viajes siempre trato de planear muy bien cuáles serán los looks que llevare ya que siento que es un complemento muy importante para mis fotos de IG. Una de las cosas que más me encanta de Show Me Your Mumu son sus print, lo chic-loose que son sus diseños y lo funcional que son para usar en cualquier ocasión. El primero look es este set Hendigo Go Go que es un estampado de paisles blanco con azul. Esta combinación de blanco con azul es uno de mis favoritos sin hablar de este estampado que me parece súper clásico y femenino. El hecho que sea 2 piezas es súper funcional por que las puedes usar juntas o separadas. ¡El segundo look es este Daffodil dress de chiffon en color amarillo que sin duda no he parado de usarlo! Este vestido lo he usado para eventos súper formales, entrevistas de televisión e inclusive para un look de playa. Normalmente no uso amarillo, pero si es un amarillo vibrante como este sin duda lo usaría ya que va muy bien con mi color de piel y sobretodo como resalta con mi tan qué agarre estos meses en el océano indico. I’ve never heard about this brand before, but seems that it has so many awesome summer clothes. Your yellow dress is gorgeous and chic, perfect for the tropical landscape. This is such a stunning brand with many beautiful options!! I love show me your mumu. In fact my favorite romper is by them! It’s so comfortable and the prints they have are always amazing. Looks like you had tons of fun on the beach. Loving that yellow dress on you. Thank you Jacqueline!!! Yes, they have so many beautiful looks. Show Me Your Mumu has always had some of the best prints and it’s no different here with the 2 looks you’re wearing here! Being the print lover I am, I would have to say that printed set is my favorite! I am still crazy obsessed with anything off the shoulder! Yes me too can’t get over the off shoulder trend lol!! I’m honestly so jealous of your travels! 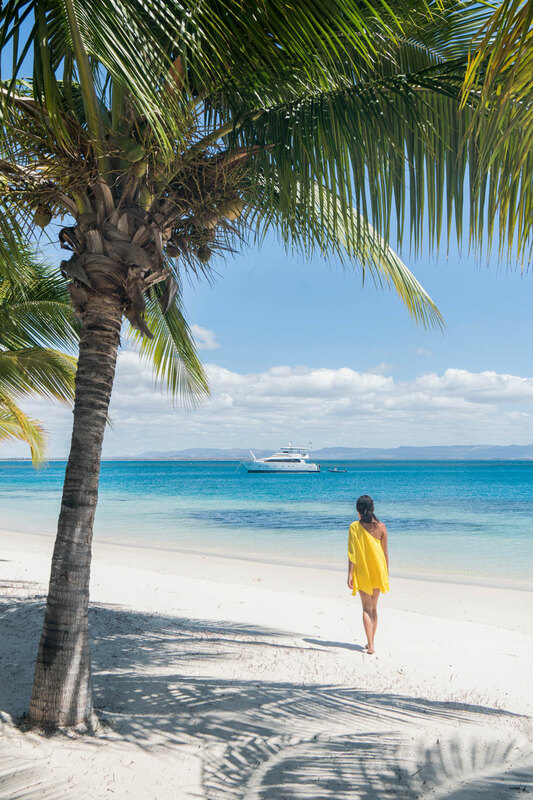 This beach is the epitome of paradise. I can imagine that South Africa will be incredible too. These pieces from Show Me Your Mumu are so cute and it’s wonderful to hear that they are donating money to those affected by the hurricane. 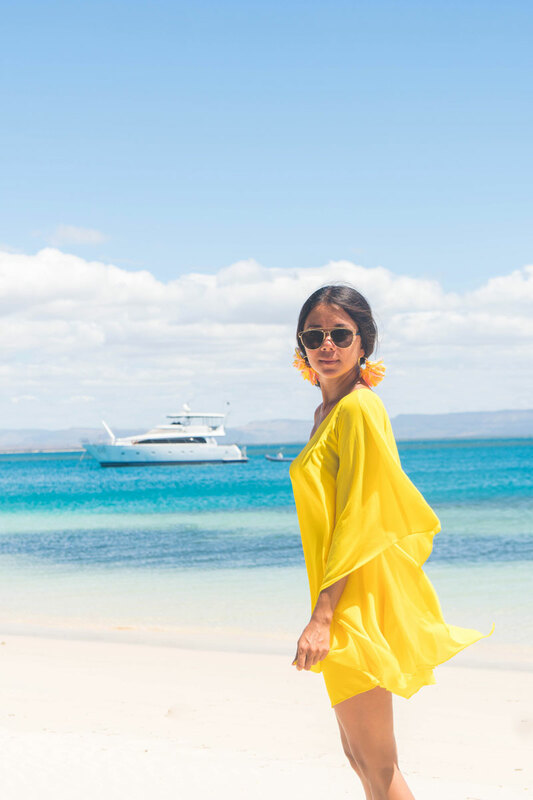 This yellow hue looks fantastic on you and I adore the floaty, one-shoulder style. You are such a beauty on pictures as always. I love your bright outfits, especially that stunning yellow dress. I always feel so happy when I see brands donating to charity organizations. The news that Show Me Your Mumu is donating 10% of their sales to the Houston Area Women’s Center makes me be more loyal to this brand (tho I’m already fall in love with their feminine clothes). I live in beachwear as streetwear so I’m all over your Show Me Your Mumu looks. That yellow is everything! I just checked out their site and I see some caftans I need in my life! Safe travels! Yes they have so many cute things Michelle! They have so many beautiful looks for a getaway! I love Shoe Me Your Mumu! They have the cutest bohemian, beach and festival looks! That’s amazing that 10% of their profits went to Texas. It is so devastating what happened there and to the South East with all of the hurricanes. Love both looks, especially the yellow dress! I believe that yellow color works really good on you. It loos fantastic against your skin color. I wonder if this place ever have a bad weather? It always looks so beautiful and bright on your photos. Makes me to think of moving to Madagascar. How exciting that you’re about to head on another adventure! Your travels always make me so jealous!! That yellow number looks amazing on you and if it came in a maxi version then I am SOLD! It sounds like such an awesome brand if they have a colourful collection like this. 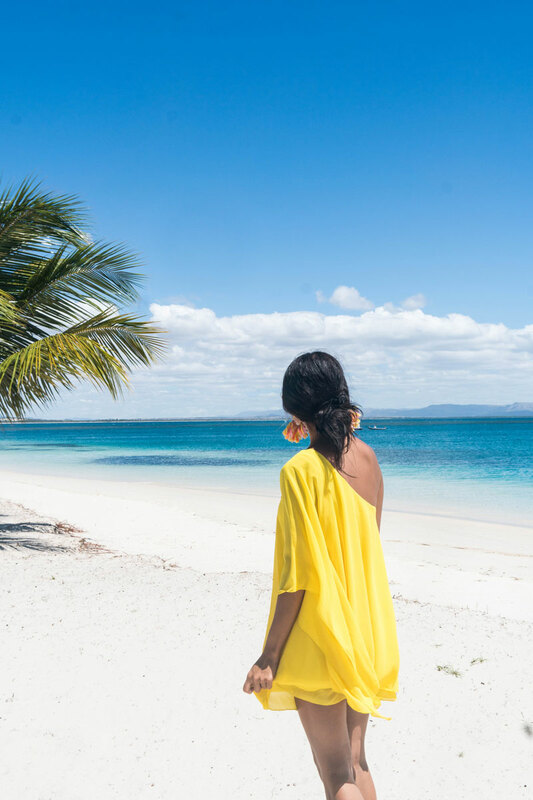 There couldn’t be a more perfect backdrop for Show Me Your Mumu than the amazing beaches of Madagaskar! I love it when brands are socially aware and give back to society just like this brand does and we as influencers as well as customers need to support brands like these to make a change and an impact in the fashion industry! Thanks for showing us this lovely brand. That yellow mumu looks absolutely amazing on you. Yellow is such a diffiuclt color to pull off, but yet you rock it! 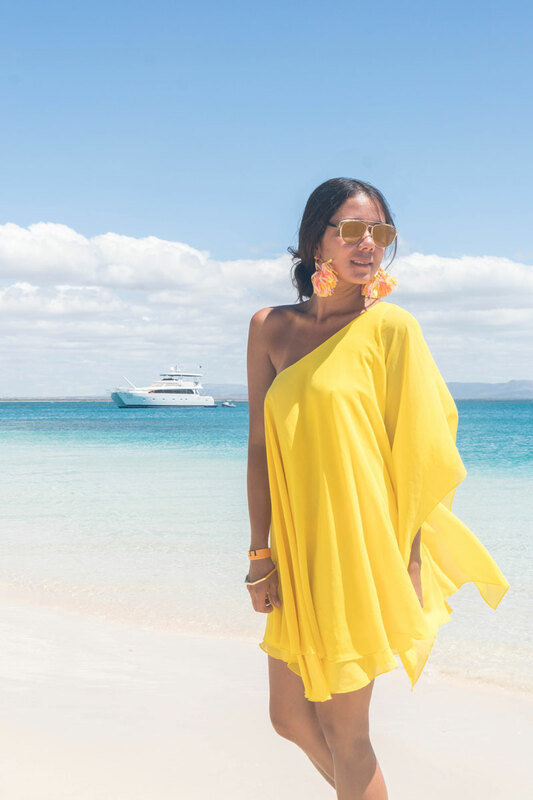 The earrings that you’ve paired with the outfit are so perfect for the beach. Mumus are so gorgeous without having to compromise comfort. These photos are stunning, and I can’t wait to hear all about your trip to South Africa! These photos are beautiful as usual! I love Show me your Mumu and I love that they are using fashion to help in such times like these. Not every company does that! Checking out their website to see what cute things I can get for my vacation in FL in December! Thank you so much for sharing! I love Show Me Your Mumu’s pretty designs! That’s so wonderful they are doing their part to help the communities affected by the hurricane in Texas. I’m definitely going to check out their shop now! Such a great initiative to help Texas! I love your mu mu and the romper. The romper is my favorite and I am so glad they are donating a percentage of sales to hurricane Harvey. I am all about fun prints for the summer so I’m already a fan of the brand 🙂 It’s actually getting chilly here in NYC and we’re transitioning into fall so sadly I have to say goodbye to summer dresses for now.